Tewz1 is a visual artist & multi-instrumentalist from Chicago, ILL.
Tewz studied visual communications, printmaking, 8/16mm film, & holography at The School of the Art Institute of Chicago (SAIC). 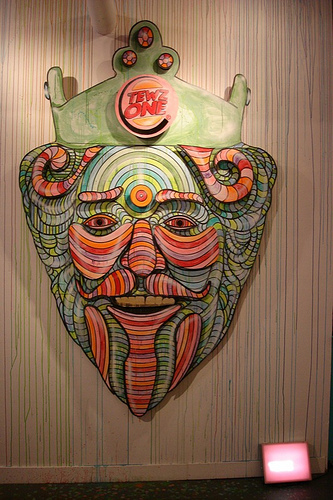 He has created & exhibited artwork for 11 Spring St. NYC, Burger King, Adidas, Juxtapoz, Lollapalooza, & North Coast Music Festival. Born & raised on the South Side of Chicago in the 80’s, Tewz was running down CTA elevated tracks, and painting tunnels in the early 90’s Chicago Graffiti scene. He co-ran the Independent Hip Hop record label Frontline in the early 00’s releasing albums by Qwazaar, J.U.I.C.E, and Slug (Atmosphere). An avid record digger and beat maker, Tewz has organized shows and performed musically both nationally and internationally in Chicago, Los Angeles, Phoenix, Austin, Reykjavik, Tokyo, Bogota, and others. Tewz played clarinet as a child before moving on to drums, guitar, keys, electronic hardware and sound production. His father played in the Chicago Hard Rock band Battle Axe. 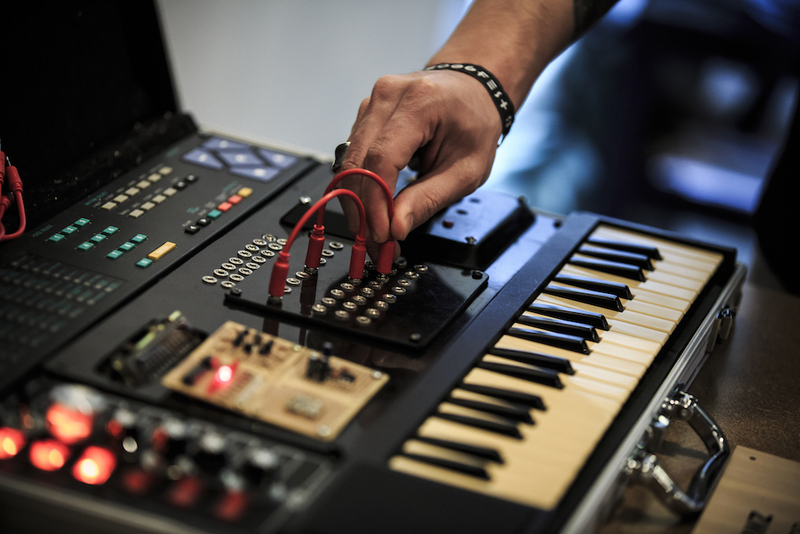 Tewz is an all hardware producer using a variety of diy electronics, analog synths, samplers, and guitar pedals including the MPC2000XL, tape loops, diy delay circuits, and other vintage gear. In 2007, Tewz won the Cut&Paste Digital Design Championship in Chicago. He self released a die-cut picture vinyl titled Helix in 2012. In 2013, he released two 7″ records on Heardrums (Michigan) & Luana (Berne, Switzerland). In 2016, Tewz won a Moog Sub Phatty at the 5th Annual MoogFest Circuit Bending Challenge modifying a yamaha VSS-30 FM synthesizer into an 8 step sequencer and patchable Bad OP-erator (M is for Moog) with built in distortion, delay, and 3-step pitch clock oscillator. Past projects include modified newspaper boxes (MonsterBox), Chicago Police Brutality Coloring Books with miniaturized offset wagons, animated gif’s of Prince & Obama, and fake postage stamps (they actually worked btw) of famous (imPOSTer)’s including Andy Kaufman (as Tony Clifton), John Howard Griffin, David Hampton, and Frank Abagnale.